Home / Shipping News / Dry Bulk Market / India: A Rising Star In The Global Steel Industry? In recent years, India’s crude steel production has expanded rapidly, reflecting firm economic growth and policies designed to boost the country’s manufacturing industry. Output has grown by a CAGR of 7.3% since 2010 to exceed 100mt for the first time in 2017, while production in December was sufficient to see India overtake Japan to become the world’s second largest steel producer, after China. India is likely to cement its position as the world’s second largest producer over the coming year, with steel demand in the country projected to grow by 6% in 2018. Looking further ahead, reports suggest India’s steel production is likely to double by 2030, with the country widely expected to be the largest source of global output growth over the period. Rapid expansion in Indian steel production in recent years has seen India become the second largest importer of coking coal. India’s coking coal demand is almost entirely met by imports, with quality and cost issues preventing domestic coking coal from being more widely used. Indian seaborne coking coal imports have grown by a CAGR of 7% since 2010 to reach 50mt in 2017, and while imports softened slightly in 2016-17, this reflected disruptions to seaborne supply. Australia and the US are the largest suppliers of coking coal to India, while imports from Mozambique are rising rapidly following investment by Indian companies in mines in the East African nation. Overall, growth in steel production is expected to drive firm expansion in Indian coking coal imports over the next decade. The impact of India’s growing steel sector on iron ore trade is more complicated. India’s iron ore reserves are the 5th largest in the world after Australia, Brazil, Russia and China, and Indian iron ore production expanded rapidly through the 2000s, with the country’s 115mt of exports accounting for 13% of global seaborne iron ore trade in 2009. However, exports fell sharply after 2010, as tariffs and mining bans discouraged the export of iron ore and sought to increase its use in the domestic steel industry. India’s iron ore exports remain historically limited, while imports have grown from 1mt in 2010 to reach 7mt in 2017. Readily available domestic iron ore is likely to prevent India’s imports from growing as firmly as those of China over the last decade, but iron ore imports are expected to continue to be a part of the picture, given that the country’s newest steel mills require high grade imported ore to maximise output. 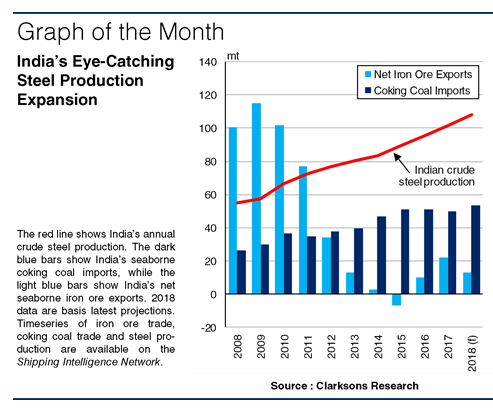 So, India’s increasing steel production has clearly has a positive impact on coking coal trade over the last decade. Looking ahead, while iron ore trade may not see a significant benefit, the country’s coking coal imports are expected to grow firmly as India remains a bright spot in the global steel industry.